Step 1: Recycle and old doormat, or cut a sheet of rubber to size (Many larger fabric stores offer various rubber products for various upholstery projects). Step 2: Before sticking down the pebbles, arrange them on the rubber mat until all the pebbles fit nicely. Step 3: Use Pattex Universal Silicone to attach the individual pebbles to the rubber mat. Apply a thick bead of silicone to the back of each press and press firmly onto the mat. 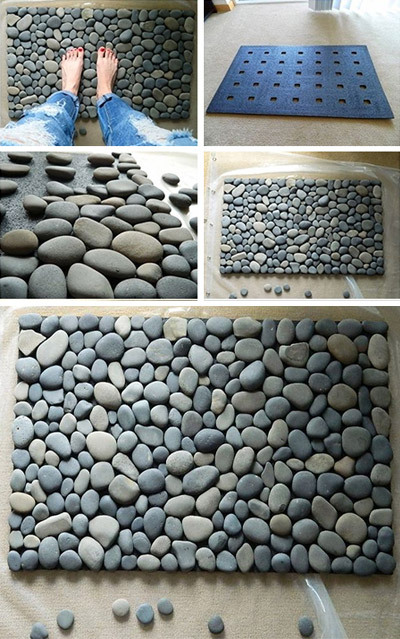 Step 4: Once you have finished sticking down all the pebbles, leave to cure for 24 hours. After that you can leave as is, or you can apply a satin on gloss spray varnish over the top.